With the evolution of Cisco’s CCNA Video and CCNA Voice certifications emerges the new Cisco CCNA Collaboration certification. With voice- and video technologies converging ever more in the world of IT, it is a certification that will only grow in stature and demand. Students will learn how to create and modify user accounts for Cisco Unified Communications Manager, configure voice messaging, maintain a Cisco Unified communications system and provide end user support. Professionals who have gained their CCNA Video certification can now recertify to CCNA Collaboration once the time arrives for their Voice certification to be recertified. Those that hold a CCNA Voice certification can obtain a CCNA Collaboration certification by passing exam 210-065 (CIVND) Implementing Cisco Video Network Devices. To earn your Cisco CCNA Collaboration qualification you will be required to study two courses and pass both of the exams – one for each course. Once you have passed the second exam you will then gain the CCNA Collaboration certification. 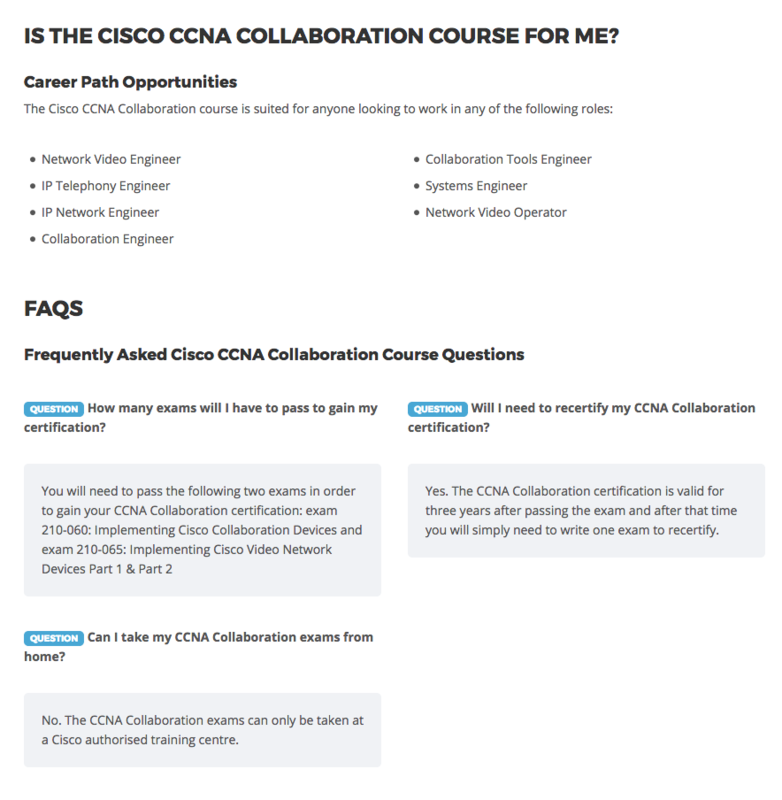 There are no prerequisites to studying the Cisco CCNA Collaboration courses.